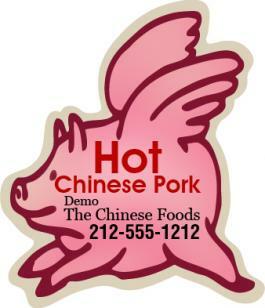 Logo imprinted promotional 2.25 x 2.62 inch pig shaped Chinese restaurant magnets -20 MIL work best for Chinese restaurants, trying to build their visibility. This magnet offers them large space for imprinting business information and as well as for acknowledging their customers. This magnet can be handed directly to customers who step into the restaurant for enjoying their meals or they can be gifted during tradeshows or food festivals, etc. Request a quote to know wholesale price benefits offered on customized 2.25 x 2.62 inch pig shaped Chinese restaurant magnets – 20 MIL. Imprint area – 0.5" x 1".